George grew up attending the Roman Catholic Church but had no Bible teaching until he heard the gospel clearly explained to him when he was 18 years old. He finally understood why Jesus, a perfect man, would die for him even though he was a sinner and definitely headed for eternal punishment. Soon after accepting Jesus as his savior, George joined the US Air Force; eventually he served on a US military base in northeast Italy. While in Italy he met missionaries working to reach Italians and recognized that God was calling him to also serve as a missionary in Italy. Kim grew up hearing the gospel from a very young age and prayed for Jesus to forgive her sins when she was six years old. She was surprised, at age nine, to learn that many people have no one to tell them about Jesus and responded to an invitation to one day serve as a missionary. In 1989 George and Kim began their service in Italy, studying the Italian language and culture at the Universita’ per Stranieri (Perugia, Italy) and serving in a church internship with La Chiesa Cristiana Evangelica dei Fratelli, Citta’ di Castello, Italy. Out of this time of service a collaboration was born with the vision of planting a church together in Umbertide, a small city just south of Citta’ di Castello. Since arriving in Umbertide in 1995, the Aguirres have given themselves to spearheading evangelistic efforts through organized activities and building relationships with the people of the city. The believers from Citta’ di Castello have actively supported and assisted these efforts. George and Kim have four children, Jordan, Adriene, Allison and Philip, who live and study in Italy. A small storefront meeting room was opened in 2005 and in 2010 a larger meeting hall was secured. 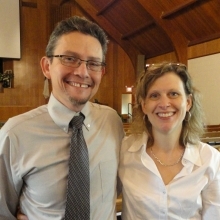 In 2007 Thomas and Rebecca Kroeckertskothen joined the Umbertide church planting team. Organized activities include individual Bibles studies (both evangelistic and discipleship), English Club for children, Sunday School, group Bible studies, Sunday worship, programs for children in local parks, concerts, hosting speakers on specific topics and monthly meals in the church meeting hall for hosting friends to hear testimonies. The Aguirres have become a part of the community through volunteering in the local schools, helping people in various kinds of needs and participating in public activities. We are involved in a church planting effort in Umbertide in collaboration with an Italian Brethren Assembly about 20 minutes north of our town. Our ministry is intentionally concentrated on ?disciple making? as we train others so that they in turn will be equipped to train others. This is done through one-on-one discipleship studies and small group Bible studies. Through more than 20 years of working and sharing our lives together, the Lord has forged a deep personal relationship between our family and the believers in the nearby Assembly of Citta’ di Castello. Our service is carried out under the guidance and with the help of the Assembly of Citta? di Castello. Often the elders of the Assembly of Citta? di Castello give advice; the elders and church members from the Castello Assembly often participate in the evangelistic outreaches and the worship service in Umbertide. A real and authentic collaboration exists to bring about the consolidation of a church in Umbertide. Umbertide is a small city of about 17,000 people. The majority of the population is Italian, but there is a growing immigrant population with people coming from all over the world.